This article, written by guest contributor Ray Sidney-Smith, originated from a conversation on Episode 142 of Workflowing. Ray is a personal productivity and GTD enthusiast, and the blogger, podcaster and organizer-facilitator behind Two Minute Rule, #ProdChat, ProdPod, Productivity Book Group, and many other productivity-inspired projects. I admit it: I am a planner. You know the type. I like to write down my ideas, create projects and write out my strategies and tactics for executing those plans. I take great pride in watching a project start, checking items off my checklist, and deftly marking my way toward each project’s finish line. But, with that out of the way, I can say that this post is all about planning and I feel like you’re duly warned. A few years ago I realized that my personal productivity system, based on Getting Things Done: The Art of Stress-Free Productivity by David Allen, was making me redo and second-guess planning over and over again on projects. While this is internally gleeful as a planner, I knew it wasn’t the best use of my abilities. So, I set out to figure out not only why projects are projects but how I could solve the problem of these projects that didn’t feel like projects anymore. Project. It’s most often used as a noun. And we discuss projects quite often as it relates to our personal productivity. This is, in large part or wholly, because of Getting Things Done having been published in 2001. In the Getting Things Done (GTD) methodology, you have Horizons of Focus (which come along with an altitude analogy) and those horizons encompass the vertical planning perspectives of life. For our discussion, I am only concerned with next-actions (runway) that make up projects (10,000 feet) that are maintained by areas of focus and responsibility (20,000 feet). 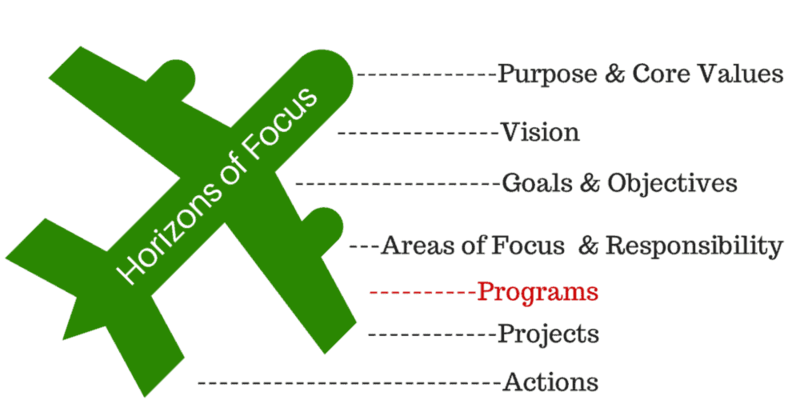 When I came upon my GTD struggles with projects, I did what most good GTDers do: I looked up a Horizon of Focus to my Areas of Focus and Responsibility. Was there something that I wasn’t maintaining there that was causing the hiccup in my system? Was there something in between that would work better for me? Areas of focus and responsibility are frequently referred to as “roles and responsibilities” to be maintained in life and work. What hats do you wear? What do I need to maintain? Son, daughter, supervisor, spouse or partner, coach, friend, mother, father, aunt, uncle, business owner…the list goes on. If I elevated certain projects that, by nature, last more than a year to the altitude of 20,000 feet, I started to review them less often (as I would anything at that height) and began to distrust my system. If I kept certain projects at the project level, the repetition problem crept back up on me. This project had several projects within it, but the parent project wasn’t meant to go away. Another project had impromptu next-action steps and child projects, but I felt the need to go through the project planning steps each time to make sure I wasn’t missing something. Some examples were my blog/podcast, my book club, my companies and several of those management areas/projects within my companies, the GTD Meetups I organize and facilitate (in Washington DC and New York City), the weekly #ProdChat Twitter-chat I host, and myriad other ongoing projects that span many years. 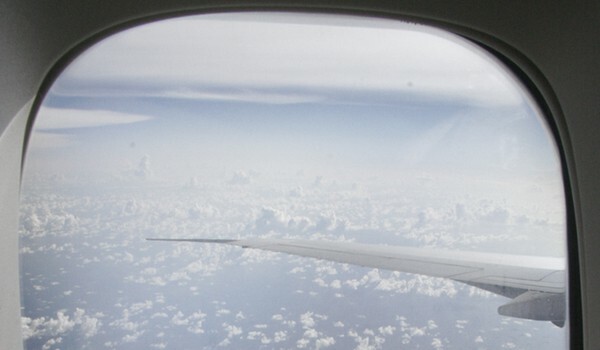 Over time I realized that I needed a new GTD horizon and I decided on 15,000 feet: The Program. A program solves for me the problem of a project that doesn’t fit the mold of GTD-defined project. (You can replace “program” with another term for 15,000 feet, but it was the best word I could find for my needs.) I needed to find a space between projects and my areas of focus and responsibility, and I settled for someplace in between. I decided to test this new horizon in my system for six months, just to see what it would look like. But, first, I developed some cornerstones for what makes a program not a project nor an area of focus and responsibility. Gets assessed on a less-regular basis than a project, and touch base with it on my higher-level monthly and quarterly reviews, whereas I only review 20,000 feet semi-annually. I can say with great confidence that six months turned into a year, a year into several years. And, I’ve never been more excited to see my programs grow. I see my roles and responsibilities in the “traditional” GTD perspective, as maintenance. And, I see projects things that I plan then achieve and attain. But I’m always looking to measure and grow programs. With this new horizon, I can see my goals clearer and get from project to next-action, knowing I have my sight on the right prize. Projects still have established boundaries in my GTD-inspired productivity system. And that’s why it was insufficient to label some projects as a “role” or “responsibility” meant only to maintain. Programs fill that gap for me; it’s something I want to foster and grow, not just maintain. I’m a steward of several of my programs and look forward to passing them along to someone someday. If you are feeling that nagging feeling you’re over-managing certain projects, or having a role that really feels like more of a project, you can implement programs into your productivity system and see how they work for you. Have you changed the horizons of focus in some way to include something similar to a program? How do you track, measure and grow ongoing projects in your life and work? Let me know in the comments below.